NE GREEN DUO Blend is a world first. 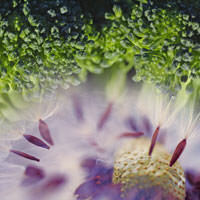 It represents unique combination of the water and water/ethanol soluble phyto-active compounds extracted from Broccoli and Milk Thistle. This blend delivers 9 powerful natural compounds, including Silymarins, in a synergistic combination that will create significant advances for skin care ranges targeting inflammation, anti-redness, rosacea, acne prone skin, whitening and hydration. NEW ACCESS to stable natural molecules from popular and new botanical species sees the evolution of the botanical extract – NOW we can design and tailor your natural ingredients to meet your target performance - naturally. Amino Acids : Methyl-Cysteine-Sulfoxide, Amino Acids : Glucosinates, Tryptophan, Phenolic Acid, Phenolic Acid : Sinapic Acid Derivative, Ascorbigens : Methoxy-1 Methyl-Ascorbates, Indole Derivatives, Amino Acids, Phenolic Acid : Caffeoyl Quinic Acid and Flavanolignans : Silymarins are peaks independently identified and verified by Plant Sciences Analytical Services, Southern Cross University New South Wales, Australia.